For the special administrative region, see Sinuiju Special Administrative Region. 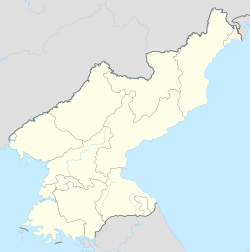 Sinŭiju (Korean pronunciation: [si.nɰi.dzu]); Sinŭiju-si, known before 1925 in English as Yeng Byen City) is a city in North Korea which faces Dandong, China across the international border of the Yalu River. It is the capital of North P'yŏngan province. Part of the city is included in the Sinŭiju Special Administrative Region, which was established in 2002 to experiment with introducing a market economy. Sinŭiju is bordered by the Yalu River, and by P'ihyŏn and Ryongch'ŏn counties. The city's altitude is 4 feet, or about one meter, above sea level. There are several islands at the mouth of the Yalu River - Wihwa-do, Rim-do, Ryuch'o-do and Tongryuch'o-do. Developed as a major settlement during the colonial rule at the terminus of a railway bridge across the Yalu (Amrok) River, Sinuiju is located 7 miles south by southwest of Ŭiju, the old city from whose name Sinŭiju (meaning “New Ŭiju”) derives. As an open port, it grew commercially with the logging industry which uses the Yalu River to transport lumber. Additionally, a chemical industry developed after the hydroelectric Sup'ung Dam was built further up the river. In the course of the Korean War, after being driven from P'yŏngyang, Kim Il Sung and his government temporarily moved its capital to Sinŭiju - although as UNC forces approached, the government again moved - this time to Kanggye. Also, the city sustained heavy damage from aerial bombardment as part of the United States Air Force's strategic bombing of North Korea, but the city has since been rebuilt. An important light industry centre in North Korea, Sinŭiju has a plant manufacturing enamelled ironware as well as a textile mill, paper mill and an afforestation factory. Its southwest harbour has a shipyard, although the shipyard's main function is seemingly to dismantle ships for scrap metal and other usable materials rather than building new ships. The area has recycling plants which recycle a wide range of material, including products that are banned for recycling in China. The Sinŭiju Cosmetics Factory is located in South Sinŭiju (Namsinŭiju). A substantial portion of North Korea's international trade, both legal and illegal, passes through Sinuiju and Dandong, across the Yalu River in China. Since 2002, commercial life has been centred on the Chaeha-dong Market. Based on a satellite image taken on 30 October 2012, the market has been destroyed and is being made into a new park. Sinŭiju can be reached from P'yŏngyang by air, railway and road. It can be reached from Dandong in China by crossing the Yalu River by bridge or boat. Foreign tourists on excursion boats from Dandong are sometimes permitted to approach within a few meters of the city's coastline, as long as they do not land. Sinŭiju's airport has a single turf runway 03/21 measuring 3,250 by 213 feet (991 by 65 metres). Air Koryŏ operates passenger and cargo flights from P'yŏngyang. Sinŭiju Ch'ŏngnyŏn Station is the northern terminus of the Korean State Railway's P'yŏngŭi Line from P'yŏngyang; the district is also served by several other stations on the P'yŏngŭi line, as well as the Tŏkhyŏn and Paengma lines. It is also connected with the Chinese city of Dandong in Liaoning Province (China) by the Sino-Korean Friendship Bridge, which is 944 m (3,097 ft) long from end to end, and through the Manchuria Railway links up with the Trans-Siberian railway. The factories of the city of Sinŭiju are provided with railway service via the Kang'an Line. Sinŭiju has a monsoonal humid continental climate (Köppen Dwa) with hot, humid and stormy summers and cold, dry winters with little snowfall. Facilities in Sinŭiju include Sinŭiju High School, Sinŭiju Commercial High School, Eastern Middle School, Sinŭiju Light Industry University, Sinŭiju University of Medicine and the Sinuiju University of Education. Scenic sites include the Tonggun Pavilion, Waterfall, and Hot Springs. There also is a Ferris wheel overlooking the Yalu River, reportedly broken. ^ 북한통계>인구일제조사>2008년>인구>도, 시/구역/군, 도시/농촌별, 성별인구 통계청 북한통계, 2018년 10월 7일 확인. ^ Minutes of the Korea Annual Conference. Seoul, South Korea: The Fukuin Printing Company. 1914. p. 27. ^ a b Mossman, Billy (June 29, 2005). United States Army in the Korean War: Ebb and Flow November 1950-July 1951. University Press of the Pacific. p. 51. ^ Rank, Michael (March 15, 2013). "North Korean-Taiwan nuclear waste deal thwarted over export permit". NK Economic Watch. Retrieved 19 March 2013. ^ Rank, Michael (30 June 2008). "North Korea in bid to recycle toxic waste". The Telegraph. Retrieved 19 March 2013. ^ "Dalian-based Huatai Recycling Resources Co Ltd" (in Chinese). Retrieved 19 March 2013. ^ a b "Market expansion: Sinuiju". North Korea Economic Watch. 3 April 2013. Retrieved 9 April 2013. ^ Cruddas, Sarah (2014-02-18). "Peering into North Korea : North Korea". BBC - Travel. Retrieved 2014-07-24. ^ "Klimatafel von Sinuiju / Korea (Nordkorea)" (PDF). Baseline climate means (1961-1990) from stations all over the world (in German). Deutscher Wetterdienst. Retrieved 6 November 2016. ^ "Station 47035 Sinuiju". Global station data 1961–1990—Sunshine Duration. Deutscher Wetterdienst. Retrieved 6 November 2016. ^ "Station Sinuiju" (in French). Meteo Climat. Retrieved 6 November 2016. ^ Kane, Daniel (October 22, 2010). "Observations from Dandong". NK News. Retrieved December 18, 2016. Further in shore I spotted Sinuiju’s signature monument, the Ferris wheel that doesn’t move. Cathcart, Adam, and Charles Kraus, “Peripheral Influence: The Sinŭiju Student Incident of 1945 and the Impact of Soviet Occupation in North Korea,” Journal of Korean Studies, Vol. 13 (2008), pp. 1–28. Wikimedia Commons has media related to Sinuiju. Wikivoyage has a travel guide for Sinuiju. North Korea Uncovered, (North Korea Google Earth) see a mapping of Sinuiju's main infrastructure, power lines, railroad, detention center, and Kim Jong Il residence, plus a whole lot more.